On Tuesday, December 7, I walked through and around Dealey Plaza in Dallas where JFK was assassinated by a lone assassin Lee Harvey Oswald (LHO). Or was he? A lone assassin, that is? Yes, he was, but that is not what anyone giving informal tours of the plaza will have you believe if you give them a few minutes (and a few bucks). I was in town filming a documentary for the Canadian Broadcasting Corporation. The subject was conspiracy theories, so it was with some irony that we happened to be filming on December 7 because there are many conspiracy theories surrounding that date as well, a date that will live in infamy, as Franklin Roosevelt so crowned that fateful day in 1941, because he supposedly either helped orchestrate the attack on Pearl Harbor or else he knew about the attack and allowed it to happen in order to galvanize the American public into supporting England against the Nazis and getting the United States into the war. There is no more to the Pearl Harbor conspiracy theory than there is that President Bush helped orchestrate 9/11 or knew about the pending attack and allowed it to happen in order to unite the American public into supporting his wars of aggression in the Middle East. Nevertheless, there is something particularly appealing to conspiracy theorists when they describe "what really happened" in their alternative universe of events. You can see it in their eyes when they begin to talk about what "they" want or don't want you to know about said event. This was certainly the case for me when I interviewed several conspiracy theorists hanging around Dealey Plaza that day. Their eye light up and they grow ever more animated (and even agitated) as their story grows in complexity about all the different people, elements, and events that almost miraculously (it would be a miracle in most re-tellings) came together to assassinate JFK. One fellow had so many people involved in the assassination that they would have needed a small sports arena to meet to plan out the day. This improbability seems to bother conspiracy theorists not one tiny bit, as they spin out their narratives, drawing you down their causal pathway that resulted in the end of Camelot. The most striking thing about being in Dealey Plaza for me was how small it is. Perhaps because the assassination itself was bigger than life we expect the geography to match the eventuality, but that is certainly not the case here. Two X's on the street mark where JFK was hit: first in the throat causing his arms to move up and splay out, and second where the bullet found its cranial mark and literally blew his brains out (and, according to one conspiricist there, sent the skull cap flying across the street and onto the adjacent lawn). 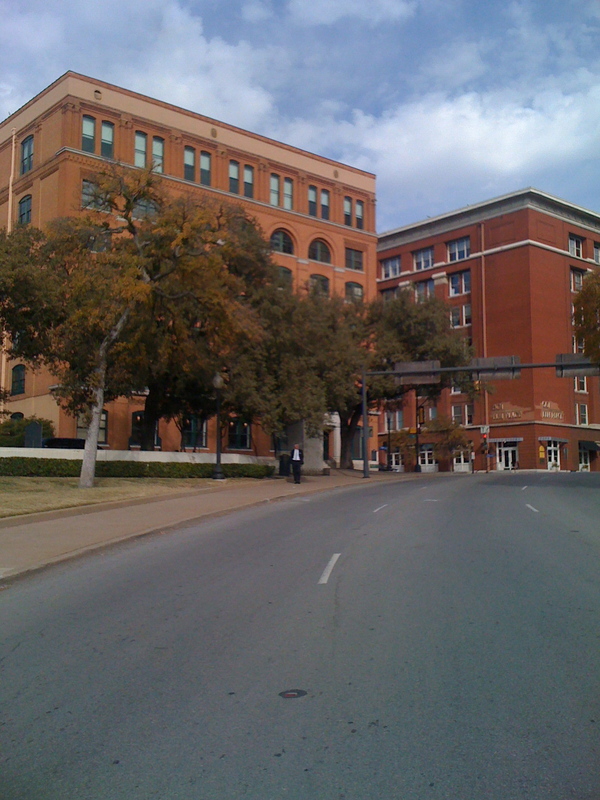 What is astounding is how close both X's are to the sniper's next in the Book Depository building. Both from the street level looking up and from the window looking down (there is a museum on the sixth floor from which you can gain the perspective of the assassin), it seems clear that Oswald could hardly have missed. Given the fact that he was designated a sharpshooter by the Marines during his time in the service, and the fact that Kennedy's car was traveling less than 10 miles per hour after making the sharp left turn onto Elm street, one is left whispering under one's breath, "Kennedy was a sitting duck." Look at the two photographs at the end of this post, each taken from one of the X's on the street (I tried to snap a pic from the sniper's nest, but this must be a problem for the museum because in addition to "No Photography" signs there is a guard standing there the entire time). 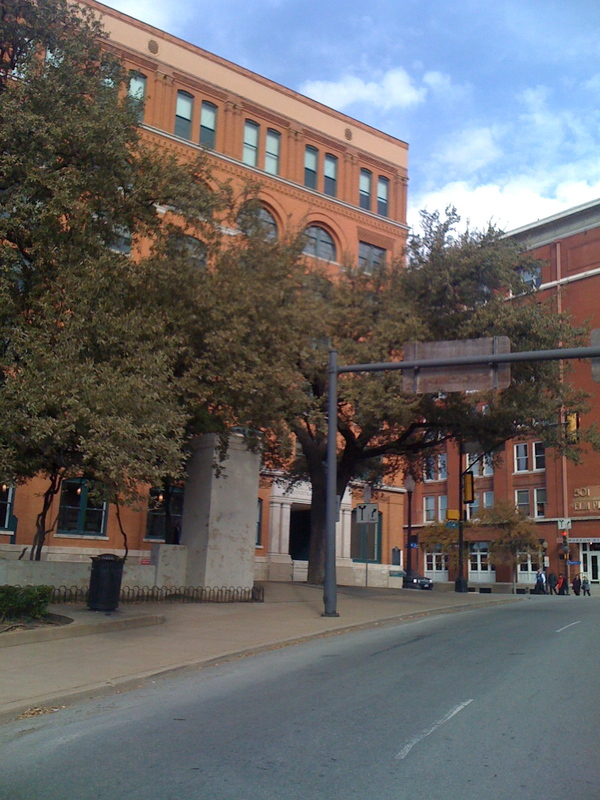 The window from which Oswald fired is the square window on the far right of the building, second from the top. Is it really necessary to invent additional assassins when it is obvious that one could have done the job? No. LHO acted alone in killing JFK. QED.